2017 butter cow at the Illinois State Fair, which was unveiled on Aug. 9, 2017. SPRINGFIELD, Ill. (WLS) -- The unofficial mascot of this year's Illinois State Fair - a butter cow -- was unveiled on Wednesday. 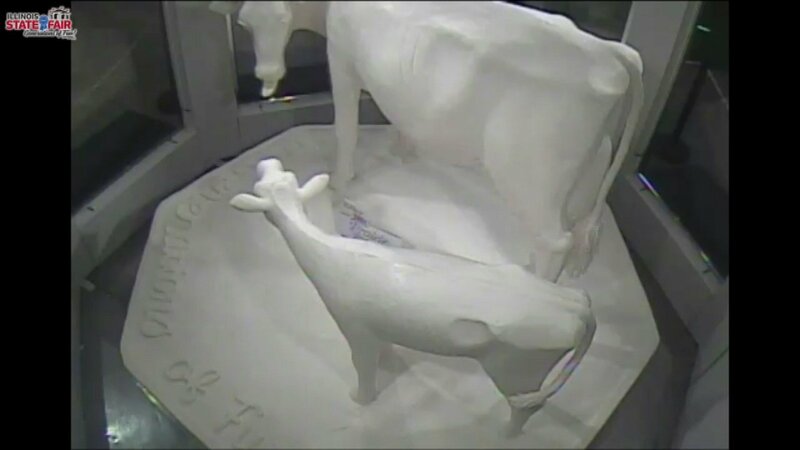 It took two days and 500 pounds of unsalted butter to make the cow. The 2017 butter cow was created by artists Sarah and Andy Pratt. "The Butter Cow is one of the most photographed and most visited attractions of the Illinois State Fair," said Illinois Ag Director Raymond Poe. "For more than 90-years, fairgoers have looked forward to this buttery bovine creation. We are extremely proud of our partnership with the Midwest Dairy Association, which allows us to keep this long-standing tradition alive at the Illinois State Fair, and we cannot wait to see what they have in store for this year's sculpture." The state fair in Springfield kicks off Thursday and runs through Aug. 20.